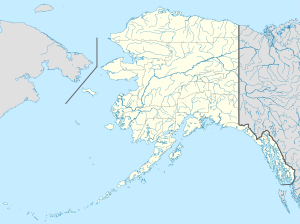 King Island (Inupiaq: Ugiuvak) (King's Island in early US sources) is an island in the Bering Sea, west of Alaska. It is about 40 miles (64 km) west of Cape Douglas and is south of Wales, Alaska. King Island, Alaska. The large boulders on the top of the island are barely visible through the fog. King island is a small island located about 40 miles (64 km) offshore, south of the village of Wales, Alaska and about 90 miles northwest of Nome. The island is about 1 mile (1.6 km) wide with steep slopes on all sides. It was named by James Cook, first European to sight the island in 1778, for Lt. James King, a member of his party. It is part of the Bering Sea unit of the Alaska Maritime National Wildlife Refuge. The island was once the winter home of a group of about 200 Inupiat who called themselves Aseuluk, meaning "people of the sea," or Ukivokmiut, from Ukivok, the village of King Island and "miut," meaning "people of" or "group of people". The Ukivokmiut spent their summers engaging in subsistence hunting and gathering on King Island and on the mainland near the location of present-day Nome, Alaska. Their winters were spent in other subsistence activities, particularly hunting and fishing on the ice. Subsistence activities on and around the island included hunting seals and walruses, crab fishing, and gathering bird eggs and other foods. The spring and summer was the important time of gathering to the Ukivokmiut, while the winters were the time of dance. Due to the limited daylight during the winter, the days were spent dancing in the "Qagri", or men's communal house. As an example, the month of December is known to the Ukivokmuit as "Sauyatugvik" or the time of drumming. After the establishment of Nome, the islanders began to sell intricate carvings to residents of Nome during the summer. In the mid-1900s the Bureau of Indian Affairs closed the school on Ukivok, forcefully taking the children of Ukivok to go to school on mainland Alaska, leaving the elders and adults to gather the needed food for winter. Because the children were not on the island to help gather food, the adults and elders had no choice but to move to mainland Alaska to make their living. By 1970, all King Island people had moved to mainland Alaska year-round. Although the King Islanders have moved off the island, they have kept a very distinct cultural identity, living a very similar life as they had on the island. Some King Islanders still return to the island to gather subsistence foods, such as walrus and seal. In 2005 and 2006 the National Science Foundation (NSF) funded a research project which brought a few King Island natives back to the island. Some participants had not been back to the island in 50 years. The King Island Community awaits the project's results. King Island first appeared on the 1880 U.S. Census as the unincorporated native Inuit village of "Ookivagamute." In 1890, it returned as Ukivok. It next appeared in 1910 as King Island and would continue to report until 1960, with the exception of 1950 when no figure was reported. It next reported as Ukivok again, classified as a native village (ANVSA) in 1980 and 1990, but with no residents. It has not reported since. Abandoned stilt village Ukivok, photographed 1978. The large white building near the bottom of the slope is the former Bureau of Indian Affairs school. Ukivok about 1892. Walrus-hide summer houses and stone winter houses are visible. King Island residents in kayaks, about 1892. The kayaks are of the characteristic King Island style> Several carry more than one person or items on deck, and the paddlers are using single-blade paddles. Two-blade paddles were also used. ^ "Geological Survey Professional Paper". U.S. Government Printing Office. 12 August 2018. Retrieved 12 August 2018 – via Google Books. Wikimedia Commons has media related to King Island, Alaska. Deanna M Kingston, "King Island", Encyclopedia of the Arctic, A-F p 1090, Routledge, 2012. This page was last edited on 12 January 2019, at 17:09 (UTC).